I’m a writer by trade and an artist by passion and genetics (my father is an artist). In the past, I’ve made jewelry and hand-made cards that were sold on Rodeo Drive in California and high-end gift shops nationwide. It’s been a while since I’ve seriously pursed my artistic bent, although I am avid photographer and cook (developing baker). So I’ve decided to take up watercolor again (and mixed media) to make improvements I never had the time or energy in the past to make, to see where this takes me. This is my journey. I hope you are having a great holiday with family and friends. Do you not have comments turned on for your post on purpose? You’re missing out on so much feedback I encourage you to turn comments on unless you have them turned off on purpose. I absolutely love the boat/marina piece. It looks so large! I’m reflagging to my Art site it has to be shared with people who appreciate art. Take care. OMG, thank you, my dear! I am a lazy blogger. I forgot to turn on comments. It IS large. I have to measure it. It’s going in our living room, to replace a dreary, dark sunset (artwork my sweetie bought online without me). Thanks for reblogging! Have a happy New Year and hope your holidays were special. Oh oh, I reposted with today’s date – did it disappear from your blog? If so, please forgive me, I am feeling a little exhausted today and not totally with it! Your blog looks amazing, by the way. Wonderful to hear! xo Glad you like! I love bright too and pastel as well. Thank you! Gee, thanks! 🙂 I appreciate it. You have made so much beautiful pictures with watercolors! It is inspiring to look at! Why, thank you so much! I need to paint some more ~ maybe today! I like to make it a daily habit. How about you? When I’m not at school and doing the interior work, then I usually sew and make jewelry at home. a lot to myself and then it’s good to have such a hobby. Right now I’m making my own collection of clothes and accessories for myself. The theme has something about winter, royal and a little typical Norwegian adventure. Loved your hibiscus — WP had a hiccup and I couldn’t post! Thank you for the blog love, Ashley! C, thinking about you with Matthew’s approach, hoping your location is far from the storm. Take care. Thank you, Laura ~ I appreciate it very much. All the best to you, as well, everyday! Lovely blog so nice to meet you! 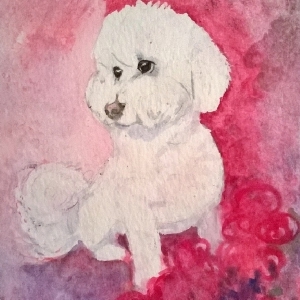 Lovely painting of your Bichon. Thank you for visiting and the follow on my site. I have so enjoyed your pages and your creative journey. Looking forward to visiting often and the creative adventures to come. Peace. ps for some reason when I click to follow you it says I already have, but I cannot find you in my reader. Hope its only a glitch and thanks for following me. Kath. Yay just found it in my reader and look forward to the inspiration of seeing your work. Nice to meet you, love your work. Kath. Love your bichon painting. what a little cutie! How lucky to have grown up in Italy! What part? Follow my blog – so you can have you comments appear without me having to approve them, lol! Your lyrical blog name pulled me in too. just happened upon your blog. Beautiful work. Thank you. And welcome to Art and Soul Space, dear Sand Salt Moon. Thanks for stopping by Killing Jar Studio. I’ve been enjoying your work for a while now and look forward to more. I’m a new follower of your blog now! And a very welcome one. Thank you! Your work is beautiful. Thanks for following my blog. I’m following your lovely blog now and looking forward to seeing your future work. Cheers, Maria. Looking forward to seeing more of your creative artworks and paintings – have a great time exploring. Cute little Bichon! Nice to meet you Sand and thank you for following my blog! Hey! I nominated you for the Liebster Award! You may check it out here: https://sabricaye.wordpress.com/2015/05/06/liebster-award/ 😉 Looking forward to more of your wonderful arts! ohhhhh!!! Is that Bichon? Ours is named ‘Elmo’–he’s going to be 7 this year. You’ve given me the courage to try painting him (fingers crossed)….thank you! Yes, a Bichon – go for it! I am looking forward to seeing your work, so far I really like your color palette, it is deliciously engaging, soft and pastel-like yet bright and flowery. Dawn, thanks for the follow and your lovely comments. Thanks for followin me at Lemon’s Tree! I think you’ve got great art chops; keep going with the watercolors! Thank you for the follow and comments! Hope to see more of your watercolor work. Is that a Bichon? I think it is great that you are into watercolor! This little dog caught my eye! Thanks! Yes, a Bichon Frise – she’s my little Chloe girl. Keep painting & practicing every day. Watch demonstrations of excellent painters. Watch how they apply brush strokes. They make every stroke count. I often look at the masters…John Singer Sargent’s watercolors are amazing! Good luck with your pursuit. Thank you, Graham. I welcome help, advice and all comments. I appreciate the support and encouragement. Good on you. Get on and explore, but get some advice – it can save a lot of time. Join an art group where there are some practitioners who will generally give you good tips and assistance. Lessons can be very expensive and can sidetrack you so are best avoided, until you have clear and specific needs.. Also develop your drawing, it is so key. Life drawing groups are great. I participate in a few and they also allow you to explore different media (again, avoid classes, but practising in a group will allow to see what others are doing and people are generous with help and advice. I just stretched my paper using staples (see my Morning Stretch post) – and now I need to follow your advice and join that group. Thanks again!! !